Franzini, a past President of CDFA and former CEO of the New Jersey Economic Development Authority (NJEDA). During her career, Caren was dedicated to the advancement of development finance best practices, education, and advocacy. financing businesses and expanding economic growth and job creation for New Jersey communities. collaborate on a project of significance to the development finance industry and present it to a national audience. Franzini Fellows may build a new type of financing program, research creative deal structures, write a publication of best practices, or demonstrate new methodologies in the development finance industry. Collectively, their work will showcase expertise in development finance and the power of women-led initiatives. To read more about the Franzini Fellowship, please visit our webpage. representing public, private and non-profit entities alike. For more information about CDFA, visit www.cdfa.net. 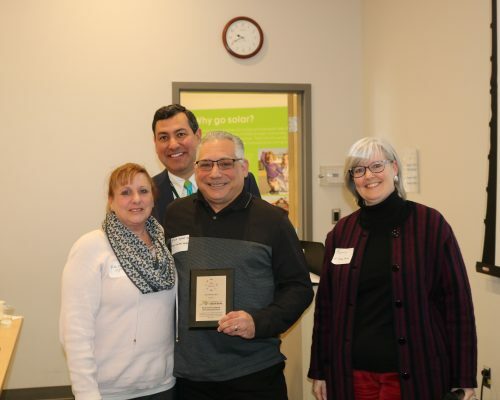 Rocky Hill, CT (March 26, 2019) – The Connecticut Green Bank has announced the winners of the 2018 PACEsetter Awards. 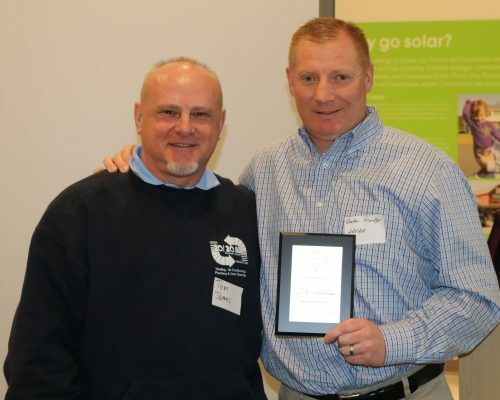 The Connecticut Green Bank created the PACEsetter Awards to acknowledge contractors, building owners and other stakeholders who are advancing the green energy movement through C-PACE, and whose leadership establishes a “pace” for others in their field to follow. The award ­­­winners are a driving force behind the success of the Green Bank’s Commercial Property Assessed Clean Energy (C-PACE) program. These are the fourth annual PACEsetter Awards. C-PACE is an innovative program, administered by the Green Bank, which helps commercial, industrial, and non-profit property owners access affordable, long-term financing for meaningful energy upgrades to their buildings. C-PACE enables building owners to finance qualifying energy efficiency and renewable energy improvements through a voluntary assessment on their property tax bill. As the program grows, more Connecticut businesses achieve lower energy costs and increase their bottom-line. Smart Roofs Solar, a commercial solar developer and C-PACE contractor based in Newtown who closed seven C-PACE projects in 2018. 64 Solar of Port Chester, NY & Spinnaker Real Estate Partners of South Norwalk for their solar project financed through C-PACE at 345 Ely Avenue in Norwalk, CT, a 122,000-square-foot warehouse building serving as a digital production facility for a global media company. This project included a solar PV system. Roberta Sinatra, Tax Collector for the Town of Brookfield, CT, who has been a leader in her municipality’s participation in C-PACE. DANBURY, Conn., March 04, 2019 (GLOBE NEWSWIRE) — FuelCell Energy, Inc. (Nasdaq: FCEL), a global leader in delivering clean, innovative and affordable fuel cell solutions for the supply, recovery and storage of energy, today announced the signing of a construction financing facility with Fifth Third Bank. The proceeds will be used by FuelCell Energy to finance the construction, installation and commissioning of the fuel cell power plant being built by the Company at the U.S. Navy Submarine Base located in Groton, Connecticut. The facility structure provides for aggregate principal commitments of up to $23 million. The initial draw amount under this facility, funded at closing, was approximately $10 million. This financing enables the installation of two SureSource 4000™ power plants for the long-term supply of power. These power plants, with total output of 7.4 megawatts and located on the submarine base will supply an existing electrical substation of the Connecticut Municipal Electric Energy Cooperative (CMEEC) and Groton Utilities under a 20-year power purchase agreement. The fuel cell plant is part of a multifaceted plan to provide new power resources and add resiliency and grid independence to key military installations. “This construction financing facility marks another important step for FuelCell Energy as we work to bring in cost efficient capital to support our project development and ownership. Fifth Third is a new financing partner for FuelCell Energy, and we certainly look forward to growing our relationship with Fifth Third further as we move forward,” said Chip Bottone, President and Chief Executive Officer, FuelCell Energy. In conjunction with this loan closing, the Company also obtained commitment letters for $23.0 million of 15-year term financing to be funded upon completion of construction, subject to negotiation and execution of definitive agreements, lender due diligence, and customary closing conditions. This financing will be provided by a consortium of banks. The Connecticut Green Bank and Inclusive Prosperity Capital, a spinout and strategic partner of the Green Bank, were engaged to source the construction and permanent financing for this project. SureSource™ power plants solve energy, environmental and business-related power generation challenges by providing ultra-clean, efficient and reliable distributed power generation. The fuel cells combine a fuel such as renewable biogas, directed biogas or clean natural gas with oxygen from the ambient air to efficiently produce ultra-clean electricity and usable high-quality heat via an electrochemical process. Customers benefit with operating cost reductions delivered in a manner that supports sustainability goals and enhances power reliability. With high availability and capacity factors, fuel cell power plants make meaningful contributions to Renewable Portfolio Standard targets. FuelCell Energy, Inc. (NASDAQ: FCEL) delivers state-of-the-art fuel cell power plants that provide environmentally responsible solutions for various applications such as utility-scale and on-site power generation, carbon capture, local hydrogen production for both transportation and industry, and long duration energy storage. Our systems cater to the needs of customers across several industries, including utility companies, municipalities, universities, government entities and a variety of industrial and commercial enterprises. With our megawatt-scale SureSource™ installations on three continents and with more than 8.0 million megawatt hours of ultra-clean power produced, FuelCell Energy is a global leader in designing, manufacturing, installing, operating and maintaining environmentally responsible fuel cell distributed power solutions. Visit us online at www.fuelcellenergy.com and follow us on Twitter @FuelCell_Energy. 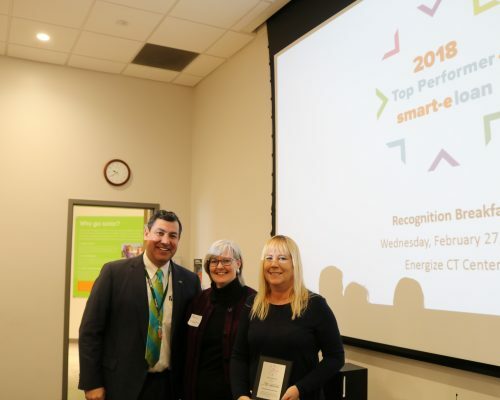 On Wednesday, Feb. 27, 2019, the 13 Smart-E Loan “Top Performers” of 2018 were honored at the Energize CT Center in North Haven. These 13 contractors are headquartered and serve customers across the state, from New Milford to North Stonington and South Windsor to East Haven, and include HVAC, home performance and solar-focused companies. 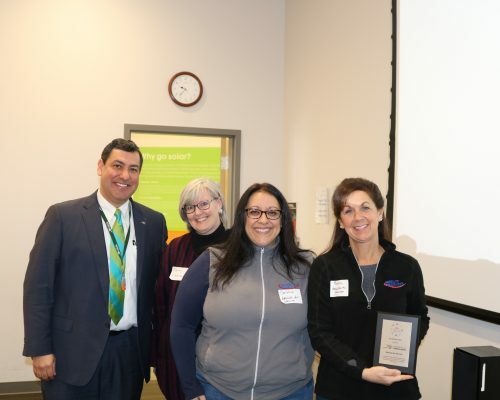 In 2018, the Top Performers helped nearly 250 Connecticut families make home energy improvements – allowing them to save money, reduce their carbon footprint, and live more comfortably in their homes. In partnership with participating local lenders, the Top Performers’ projects equaled $3.4 million in closed Smart-E Loans. Financed projects include insulation and window upgrades, solar, high efficiency heating and cooling solutions, and more; all helping the state of Connecticut work towards meeting the goals set forth in the Comprehensive Energy Strategy. 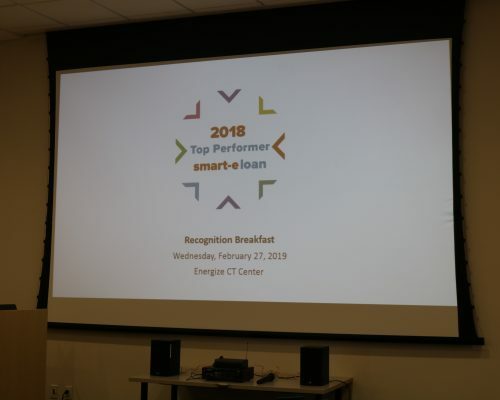 Out of more than 400 contractors who participate in the program, the Smart-E Loan Top Performers were chosen based on criteria including: having a minimum of 10 closed loans, scheduling in-person Smart-E training for their staff, using Smart-E marketing materials, developing partnerships with Smart-E lenders, and avoiding inspection issues. These 13 contractors embraced the Smart-E Loan in 2018, utilizing the flexibility of the product to best serve their customers. 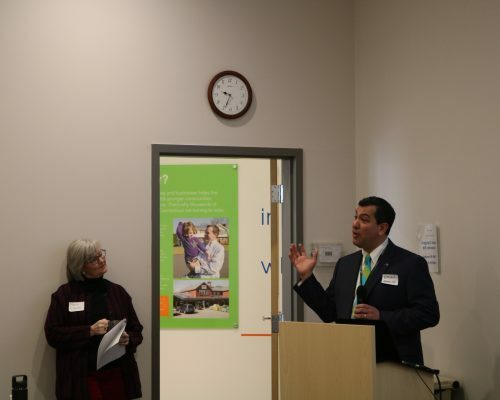 Green Bank President and CEO Bryan Garcia addresses the crowd while Inclusive Prosperity Capital's CEO Kerry O'Neill looks on. 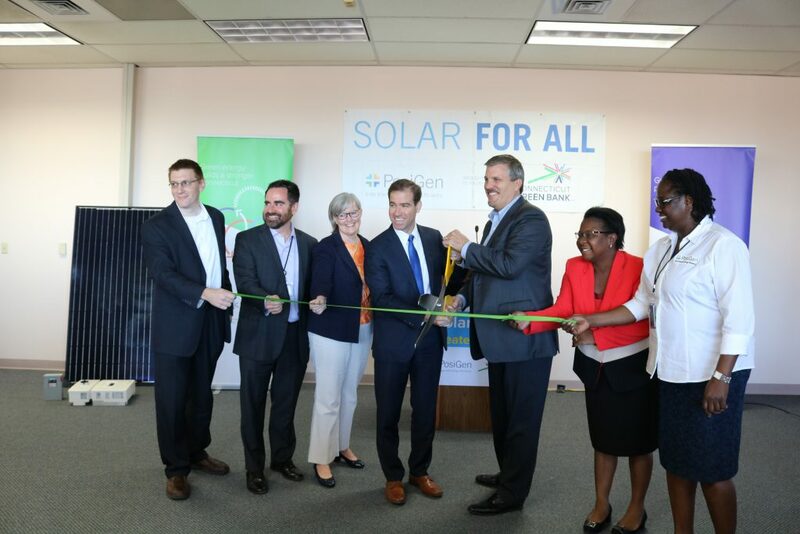 NEW ORLEANS, Jan. 23, 2019 – PosiGen, the nation’s leading provider of renewable energy and efficiency solutions for low-to-moderate income households, is pleased to announce a credit facility structured and provided by LibreMax Capital, a New York based asset management firm, in conjunction with the Connecticut Green Bank, the nation’s first green bank, and Inclusive Prosperity Capital, a new not-for-profit clean energy investment fund sparked by the Connecticut Green Bank. The three-year, $90 million credit facility will allow PosiGen to continue to lease solar systems and provide energy efficiency upgrades to low-to-moderate income homeowners in Louisiana, Connecticut, New York and New Jersey. It also enables the company to expand its footprint into additional markets and states. 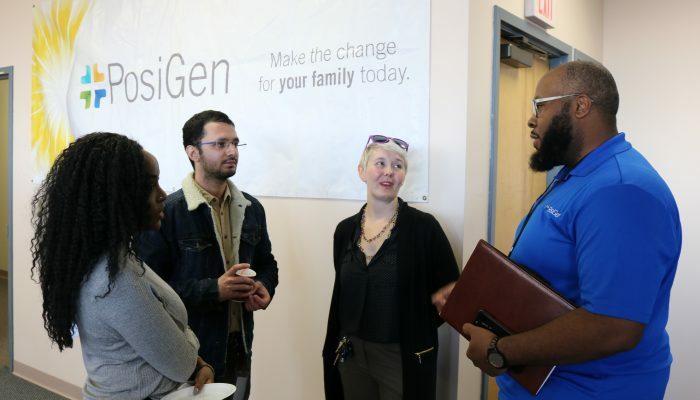 Headquartered in New Orleans, LA, PosiGen is one of the nation’s leading residential solar, energy efficiency and energy education providers for low-to-moderate income families. PosiGen has more than 13,000 residential customers, over 220 direct employees and supports more than 120 employees through its contractors in Louisiana, Connecticut, New Jersey and Florida. PosiGen’s unique services and products make solar energy affordable to homeowners of all income levels, and offer individuals, families and businesses the opportunity to achieve greater fiscal autonomy and energy independence by lowering their utility bills. To learn everything about PosiGen, please visit www.posigen.com. The Connecticut Green Bank (formerly the Clean Energy Finance and Investment Authority) was established by the Connecticut General Assembly on July 1, 2011 as a part of Public Act 11-80. As the nation’s first full-scale green bank, it is leading the clean energy finance movement by leveraging public and private funds to scale-up renewable energy deployment and energy efficiency projects across Connecticut. The Green Bank’s success in accelerating private investment in clean energy is helping Connecticut create jobs, increase economic prosperity, promote energy security and address climate change. 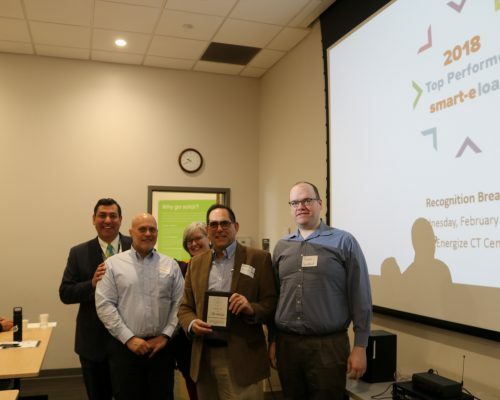 In 2017, the Connecticut Green Bank received the Innovations in American Government Award from the Harvard Kennedy School Ash Center for Democratic Governance and innovation for their “Sparking the Green Bank Movement” entry. For more information about the Connecticut Green Bank, please visit www.ctgreenbank.com. Inclusive Prosperity Capital, Inc. (“IPC”) is a not-for-profit investment fund scaling clean energy financing solutions that channels investment capital to program partners in communities that need it most. As a spin-out and strategic partner of the Connecticut Green Bank, IPC is focused on scaling its work in Connecticut and expanding its successful model into other regions by accessing mission-driven capital and partnerships. IPC operates at the intersection of community development, clean energy finance, and climate impact. We believe everyone should have access to the benefits of clean energy, helping to deliver Inclusive Prosperity. www.inclusiveprosperitycapital.org. Mark Robbins from MHR Development (far right) turns on the power with staff members from VND. 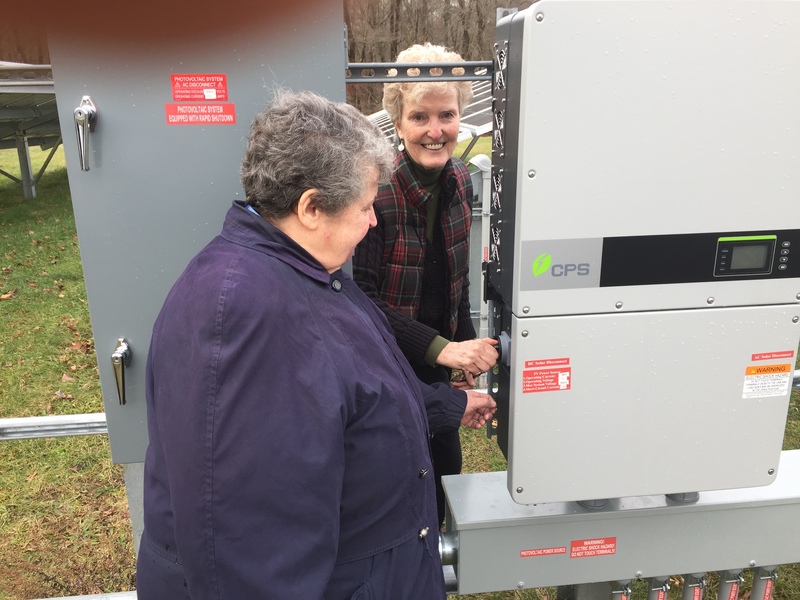 The School Sisters of Notre Dame of the Atlantic-Midwest Province are showing their commitment to ecological responsibility by establishing solar power at their complex on Belden Hill Road in Wilton Connecticut. 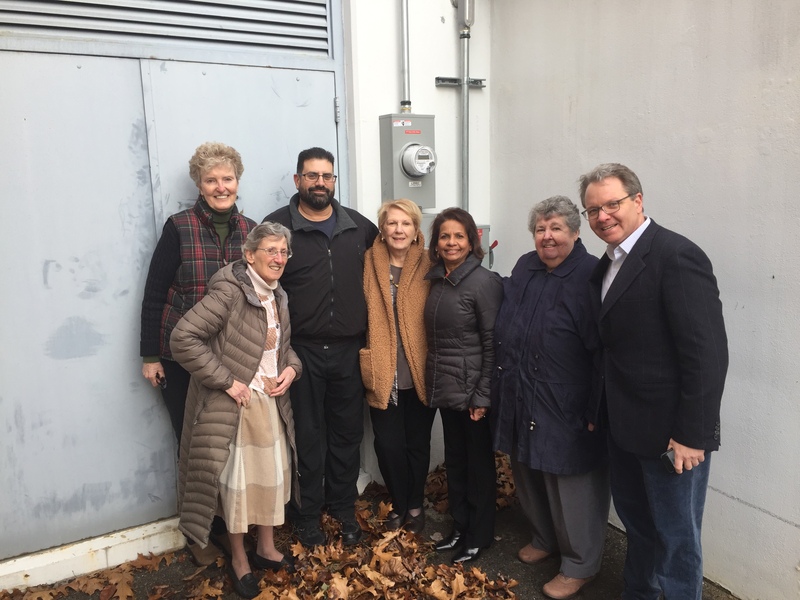 On December 17, 2018 they turned on their two solar arrays – a 122 kW ground-mounted system (Solar Garden) and a 37 kW roof-mounted system (on top of Lourdes’s Healthcare Center) – for the first time. Sister Arlene Flaherty, OP, and Sister Ethel Howley, SSND, check out the new equipment. This project is the final component of a comprehensive energy project for the Belden Hill Road property that encompasses the Sisters’ efforts to increase energy efficiency, reduce operational costs and generate renewable energy. MHR Development partnered with the province to evaluate all of the facility’s energy and water resource demands, as well as occupant comfort needs, to craft a master sustainability plan. Together, the two systems are expected to generate approximately 200,000 kWh/year, or 25% of the facility’s electrical load. Moreover, the solar installations will generate approximately $20,600 per year in renewable energy credits that will help underwrite the systems’ cost. It is estimated that the project will offset 510 tons of carbon dioxide from the atmosphere annually, and that there will be a net reduction of 400,000 kWh in grid power used annually. The congregation of the School Sisters of Notre Dame is an international community of women religious. The sisters educate with a world vision, believing that the world can be changed through the transformation of persons. The sisters and their colleagues seek to empower women, youth and persons who are poor or marginalized and strive to change systems of poverty and injustice. Approximately 2,500 SSNDs currently minister in 30 countries. Please direct all media inquiries to Caelie Haines, Communications Director, School Sisters of Notre Dame, at (410) 377-7774, x1164. Cutting the ribbon are Hartford Mayor Luke Bronin and PosiGen CEO Tom Neyhart. 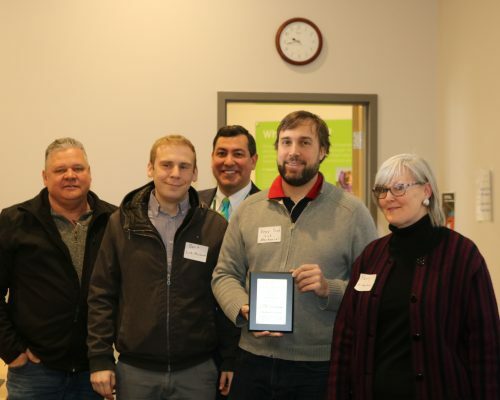 Also pictured, from left to right, are Matt Macunas of the Connecticut Green Bank, DEEP Commissioner and Green Bank Board Member Rob Klee, Kerry O’Neill of Inclusive Prosperity Capital, Karraine Moody of Hartford Area Habitat for Humanity, and Susan Young of PosiGen. 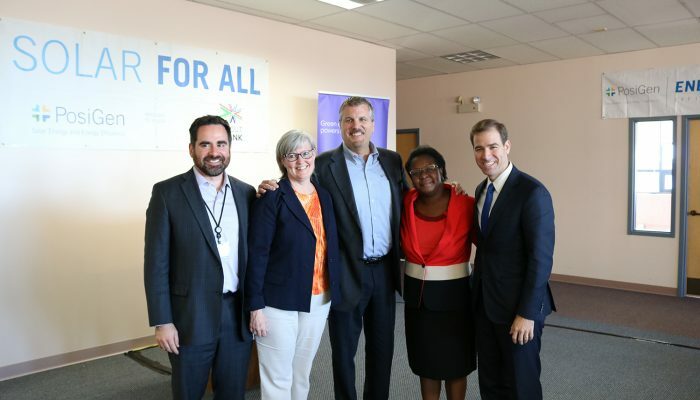 Hartford, CT – On Friday, October 5, Hartford Mayor Luke Bronin and Department of Energy and Environmental Protection Commissioner Rob Klee welcomed PosiGen to Hartford at a ribbon cutting for their new office. 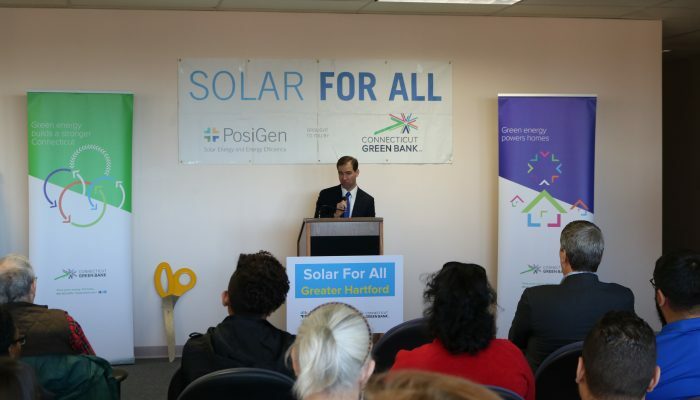 In addition to new, well-paying jobs for the Capitol Region, PosiGen brings the Solar for All initiative, a nationally recognized program, financed through a public-private partnership between PosiGen and the Connecticut Green Bank, to area homeowners. 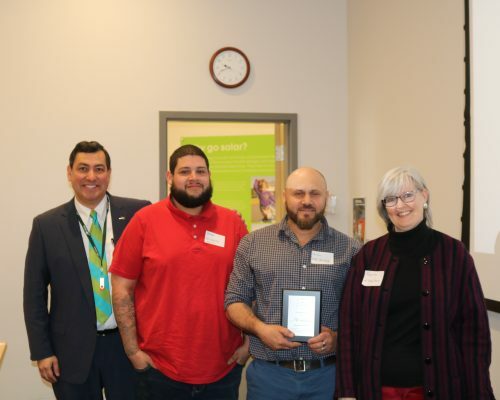 The program offers a no money down, no credit requirement solar lease with energy efficiency upgrades to lower the energy burden on participating households. 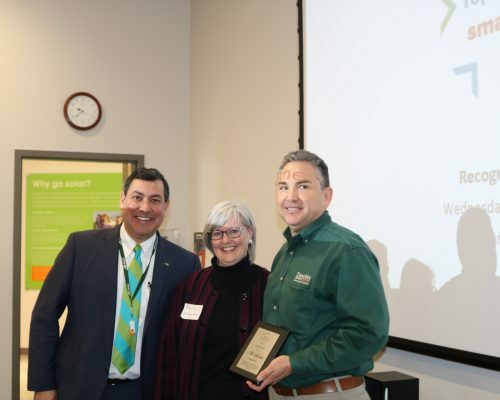 With 1,700 residential solar and energy efficiency projects installed in three short years, PosiGen’s mission-oriented operation has an opportunity to grow through a second Connecticut office. 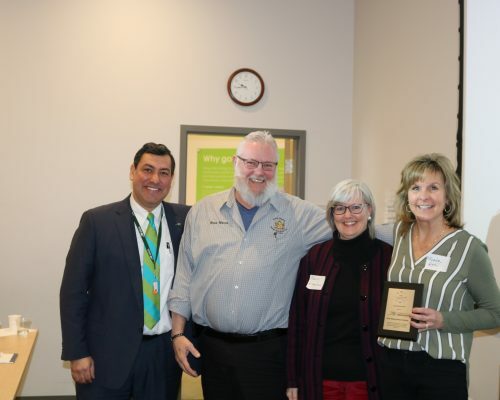 The program’s success combines an affordable solar program, energy efficiency services, and a community partnership program to better reach those who need it most; 60% of customers are low and moderate-income homeowners, proving solar is not just for the rich. “PosiGen’s success is a testament that it is possible to do it all: deploy clean energy options that help reduce our greenhouse gas emissions, package that with energy efficiency services that improve our housing stock, and ensure these resources are accessible to all Connecticut residents, while creating jobs and shrinking the energy-affordability gap,” said Commissioner Klee. 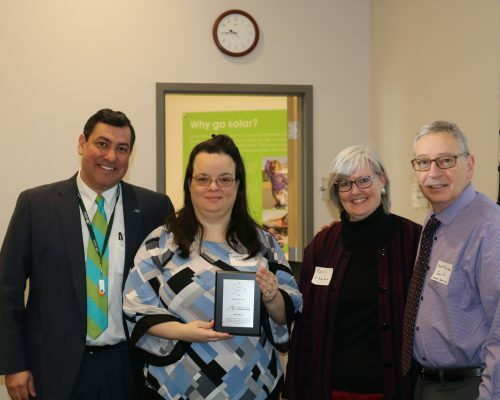 “Once one of our homeowners signed up and curiosity spread throughout the neighborhood, everyone wanted to know how the program could help lower their utility bills,” explained Karraine Moody, Executive Director for Hartford Area Habitat for Humanity and community partner of the program. Solar for All relies on a community outreach model to reach underserved communities. PosiGen has developed a Community Partnership program to reward non-profits for spreading the word about solar. With 19 Habitat homeowners going solar so far, the partnership has been one of the most successful. Appropriately housed in the Hartford American Jobs Center, the location of PosiGen’s second office is an indicator of what this company will bring to the region. 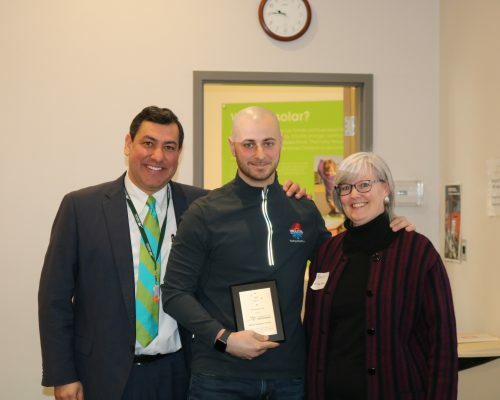 Since opening their first Connecticut office in Bridgeport in 2015, they have hired over 50 employees with an additional 50 staff employed through PosiGen’s subcontractors. “PosiGen has long hired within the communities we serve. We’re excited to make Hartford our second home, creating jobs and helping homeowners cut their energy costs,” said Tom Neyhart, President of PosiGen.